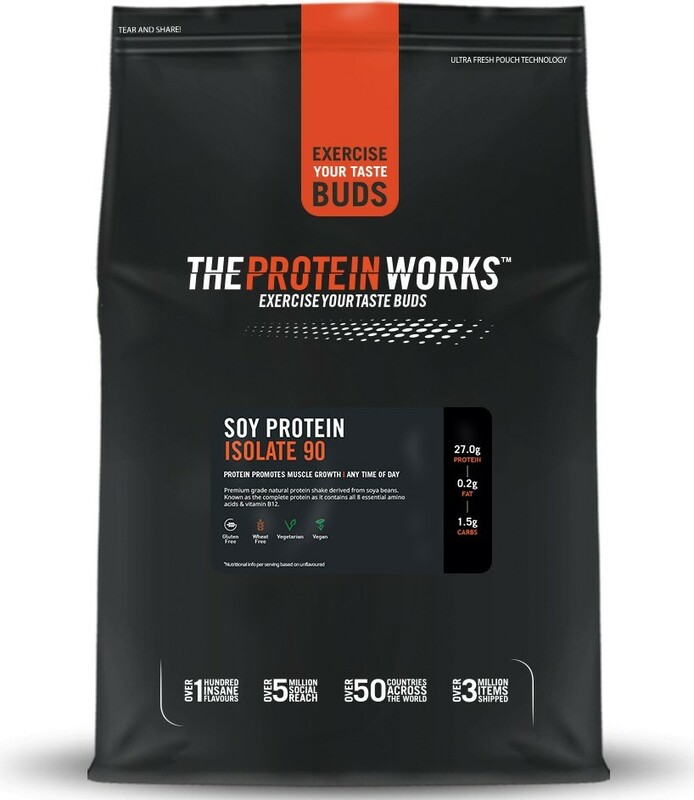 Soy Protein 90 from The Protein Works™ uses only the finest quality Soy Protein Isolate on the market today. It is manufactured in-house at our own production facility to ensure the highest possible quality levels at unbeatable value for money. 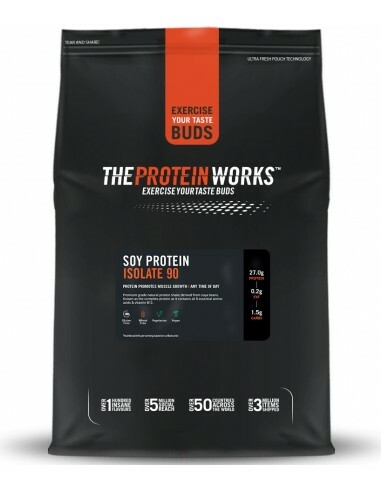 Our soya protein isolate powder provides over 90% soy protein per 100g (dry basis), is backed up with the very latest independent product test results and comes supported by months of research from the TPW™ lab. As our nutritionists tirelessly worked through soy-based studies published in the International Journal of Medical Sciences and beyond. Soy Protein Isolate 90 is high in protein and low in fat. It is the perfect protein source for both vegans and vegetarians and those with a dairy intolerance. It is ideal for building quality muscle and is instantised to ensure easy mixing. HOW IS SOY PROTEIN POWDER MADE? Soy Protein Isolate 90 is the most refined form of soy protein, isolated from the soya bean which is then defatted and most of the carbohydrates removed. The soya bean is a legume that contains no cholesterol and is naturally low in saturated fats. Soya beans are the only vegetable that contain all EIGHT of the essential amino acids. Isolated soya protein is easily digested by the body with a digestible rating of 95-98%. If you follow a vegan diet, Soy Protein Isolate 90 is considered a nutritionally complete protein and can help provide the essential vitamin B12, which is only found in animal proteins. This is based on thousands of studies but notably research published in The Current Sports Medicine Reports that focuses on vegan and vegetarian athlete’s diets. Here at TPW™, you can have supreme confidence in the product quality and supply source. Each ingredient supplier must pass rigorous audits and checks before being given the TPW™ quality seal of approval. Traceability, quality, and consistency are the three things we demand on every single ingredient. This is our philosophy that flows through every product we manufacture and sets us apart in the world of sports nutrition today. When it comes to our soy protein products this is also supported by research published in the Nutrition Journal . Click on the Product Profile and the Protein Insight to see full product information for your absolute peace of mind. We recommend you use between 2-3 servings per day, or as required to meet your individual needs. Add 250-350ml of water or milk into your TPW™ Master Blender. Add 1 scoop (30g), then shake and consume. The less water you use, the thicker your shake will be, so adjust to suit your own taste.